For example, you may have a character who says nothing for 10 frames between two speeches. Harmony would normally assign an X image for the silent period. 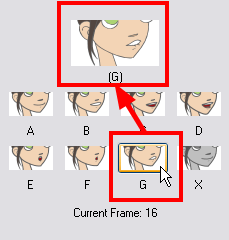 However, if you want your character's mouth to hang open in astonishment for these 10 frames, you can change the lip assignment for these frames from an X to an F.